The function of a Marketing department has notably evolved throughout the years. Once integrated with the Sales department and with a sole function of pushing a company’s products and services to the consumers, the modern Marketing department has taken a specialized role in building a company’s brand, stimulating and estimating future demand, managing competition, and dealing with customers and detractors alike. To support all these activities, the Marketing department looks to the Finance department to give it its share of the company’s budget. Oftentimes, however, this rather straightforward exercise becomes a heated battleground between the two departments. 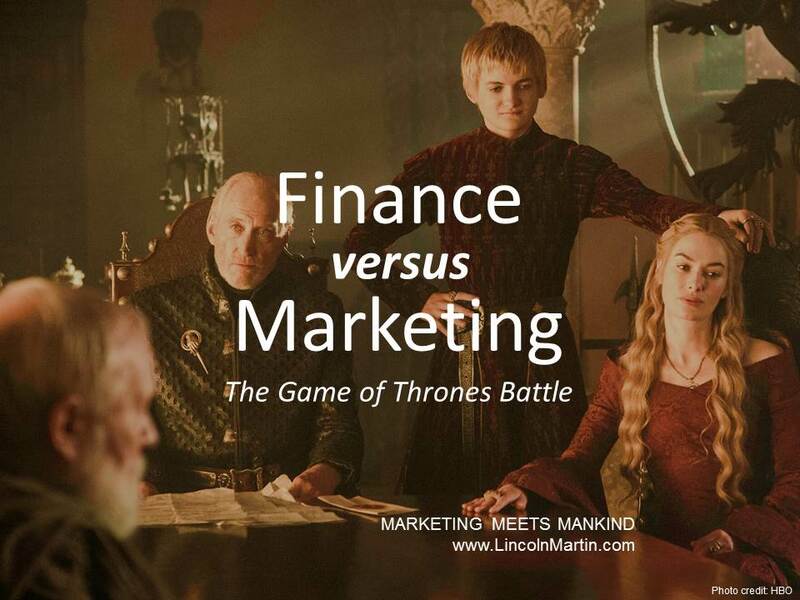 Marketing is very similar to House Stark (HBO’s Game of Thrones). Members of Stark have highly specialized communications and networking skills, which have helped them survive times of crisis and distress. Like Marketing, Starks live by their contacts, and are able to maximize any new relationship they forge with another group. On the other hand, Finance is comparable to House Lannister. They support the Crown with their Lannister Gold, which allows them to sustain a financially stable and satisfied kingdom. They focus a large part of their efforts in establishing and maintaining a complex fiscal system, and are always on their toes to avert unexpected financial downturns or collapses. In an office setting, the conflict arises when one of the departments blames the other for any eventual shortcoming. For instance, Marketing blames Finance for its failure to disburse funds needed to carry out its functions, while Finance throws the fault at Marketing for not being able to meet demand targets so expected revenues are not achieved. Finance always say that the value of Marketing’s activities are hard to measure, while Marketing says that the reason why it cannot fully execute its plans is that Finance always chews the iron pellets when it comes to allocating Marketing’s budget. This almost always results in animosity between the two departments, which will ultimately affect the bottom line of the company that they belong to. Is integration the key in resolving their conflict? Most experts believe so. They see merit in exposing the members of the two departments to the function of one another so that they understand each’s strategies and, together, translate them into financial performance. By letting Finance people into Marketing’s realm, they will realize that marketing costs should not be seen as a burden to the company’s budget but as an investment. Though it is quite challenging to ascertain the profitability of Marketing’s activities, Finance can utilize the incremental profitability approach to analyze the real benefits of investing in the Marketing department’s activities. The point of this is to determine the contribution of the investment poured into Marketing in the company’s overall success. It will also help if the Marketing and Finance departments study a case of a reputable company in the same industry to understand how much investment this company puts in in its marketing exercises. This benchmarking exercise will let the two departments set realistic goals, project sensible demand and profit numbers, and eliminate unnecessary cost duplications. With the advent of digital marketing, big data and growth hackers, it is easier for the Finance department to determine the ROI of each advertising campaigns, brand activation or marketing projects. Furthermore, new products introduced to the public by the Marketing department can be assessed via forecast-versus-sales ratio. In Marketing analytics, data can’t lie to anyone, especially to the Finance department who are always looking for results or bottom line. Company executives should remind Marketing and Finance that they are members of the same company, and that the ultimate goal is maximizing the firm’s profit and enhancing shareholder value. Marketing people should involve Finance personnel in the planning process of the department, while Finance employees should invite Marketers to contribute their input in formulating the marketing budget. Marketing and Finance are undoubtedly two key departments of any modern company. Keeping these departments individually strong is vital for the successful completion of their respective tasks, but making them formidable as a team is crucial to the viability of the company they belong to.